The Financial Aid Office has received reports from concerned students and families of a direct marketing mailing sent without the knowledge of Lafayette College. The mailing was sent by the Student Financial Resource Center and is addressed to “(Name of Lafayette College Student) or Parents of”. 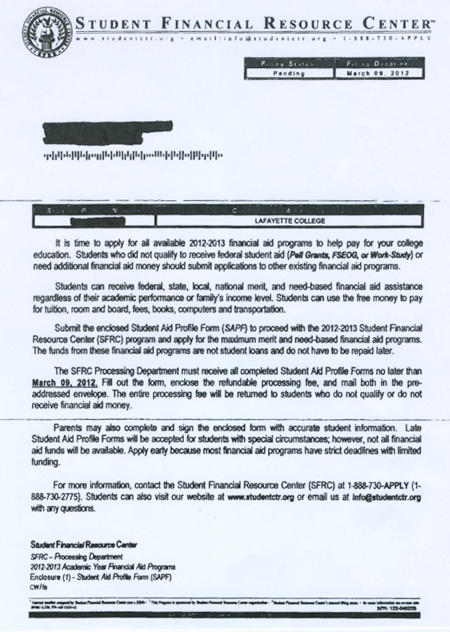 This organization is suggesting that you complete its enclosed Student Aid Profile Form to apply for additional funding and return it with a check for $65. File your complaint with the Consumer Protection Division in your state. Report possible fraud to the Office of Inspector General hotline at 1-800-MIS-USED (1-800-647-8733) or email oig.hotline@ed.gov. Special agents in the Office of Inspector General investigate fraud involving federal education dollars.